One of the strangest plants of the desert, the night blooming cereus, is a member of the cactus family that resembles nothing more than a dead bush most of the year. It is rarely seen in the wild because of its inconspicuousness. But for one midsummer's night each year, its exqusitely scented flower opens as night falls, then closes forever with the first rays of the morning sun. Sonoran and Chihuahuan deserts of southern Arizona, east to western Texas and south to northern Mexico. Desert flats and washes between 3000 and 5000 feet, often in the shade of desert shrubs like creosote. These very fragrant trumpet-shaped flowers, which bloom for only one night in June or July, are up to 4 inches wide and as much as 8 inches long. The waxy, creamy-white, many-petaled flowers are followed by a red-orange, short-spined elliptical fruit about three inches long. 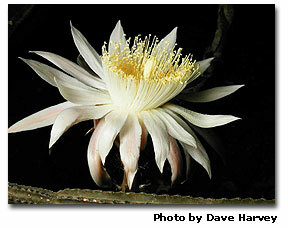 The night-blooming cereus has sparse, angular, lead-gray, twiggy stems about 1/2 inch in diameter. Extremeley small spines grow along the 4 to 6 ribs of these woody stems, which can easily break. It can be erect or sprawling, reaching a length of up to 8 feet, but is usually half that length. The night blooming cereus has a tuberous, turnip-like root usually weighing 5 to 15 pounds (but in some specimens weighing over 100 pounds), which Native Americans used as a food source. A close Baja relation (Peniocereus. johnstonii), called Saramatraca, Pitayita, or Matraca is locally popular for its edible tuber, which is said to account for the plant's scarcity there. 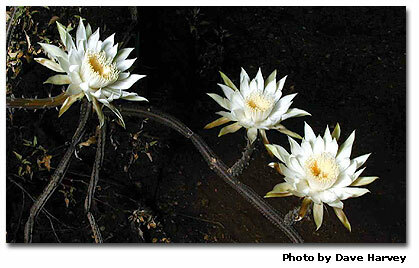 Night-blooming cereus is popular in rock gardens and can be grown from stem cuttings. After the cut end is is allowed to heal for several weeks, it is planted in dry sand. Like all cactus, night-blooming cereus may be protected in certain desert areas, and permits may be required to collect it.